As a teacher lectures in a classroom, silence fills the room. This can be disorienting to some because most college classrooms are filled with sounds of teachers and students talking. But the silence is normal for the American Sign Language students who are intently watching their teacher sign assignment instructions and lectures. The ASL program at TCC is located on TR Campus and recently became an accredited program after years of hard work. 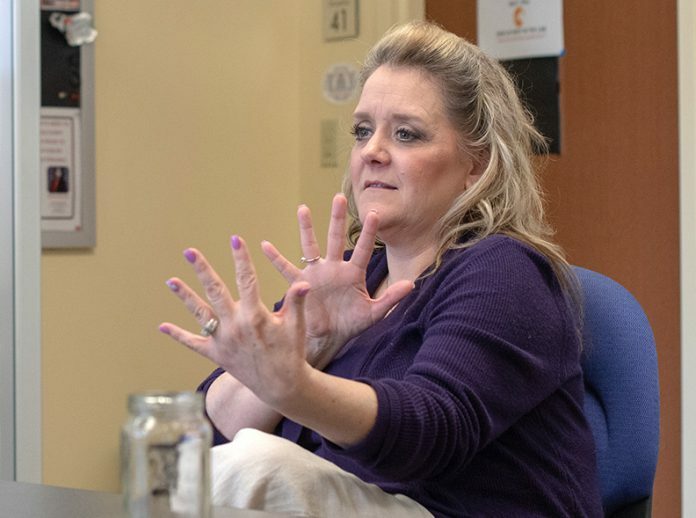 “We are only the fifth two-year college in the United States to earn accreditation,” ASL instructor Peggy Cobb said. This accreditation is important for TCC. The Commission on Collegiate Interpreter Education decides if an ASL program is competitive enough to be accredited. After they visited they made their decision, pass or fail, and TCC’s ASL program passed. “It’s not easily earned so I’m just proud of the whole team,” said Sammie Sheppard, ASL program coordinator. The new accreditation means the ASL interpreting program is not some easy program. First-year students learn ASL in immersed courses, she said. “They have deaf teachers who teach those classes voice-off,” Sheppard said. Students are forced to use what they learn in class. After the first year of the program, students have to go through a mid-program-review-application process and pass it to be able to move onto the second year. Students are tested on their ability to understand and use sign language. They also have to pass a background check, a drug screening and get recommendations from teachers. If a student doesn’t make it through the application process, they can try again later. If they do pass, they are going to be extremely busy for the next year of their lives. Students have to get 240 hours of service each semester on top of other responsibilities. During the second year, students are either in class or on an assignment, which take place all over the DFW, she said. “Even for the best students, it is a grueling year, but it is a profession we don’t take lightly,” she said. Besides just learning how to sign, students get to learn a lot about the deaf community while in the program. For example, a term to avoid calling a deaf person would be hearing impaired, even though many places like doctor offices and businesses put that term on papers to describe them, TR student Kaylee Floyd said. TR student Edward Monreal said the difference between an interpreter and a translator is that a translator works with text and an interpreter works with spoken language. Deaf people, as they prefer to be called, are independent and don’t need help, so interpreters don’t like the term “helpers,” he said.